1100+ Attractive Desktop Gadgets for Windows 7 and Vista ~ Download Everything You Need ! Windows seven desktop gadgets are small specialized tools that used to do simple task like clock, RSS notifiers, calenders and search features. Some of them may enlightened your desktop by putting a marvelous picture slide show and some will refreshes you by allowing you to play simple games like Tic-Tac-Toe, Word games, Matching tiles etc. Windows 7 desktop Gadgets are fully customizable. You can re-size and put it anywhere on the desktop. You can even change the style of a gadget by clicking on the top left button or connecting online to choose and download designs. 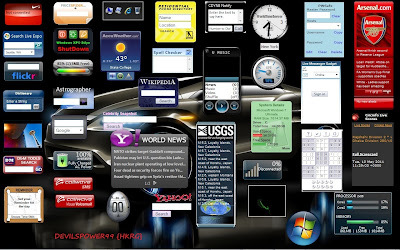 Here i'm sharing with you 1100+ desktop gadgets which you can use on both windows seven or vista platforms. There is nothing required to install these gadgets. just download and double click on a gadget to run it.